There’s little that’s more jarring than listening to one member of a musical ensemble whose instrument is out of tune—be it band, orchestra, or small ensemble. At one time, we relied on our ears to help adjust our instruments to the proper pitch. Thanks to technology in the form of electronic tuners, that’s no longer necessary. Using one of these tuners you can play a note and see exactly where its pitch falls. These tuners were once the exclusive purview of hardware devices that you’d purchase at the local music shop. These doodads generally carry both a microphone and audio input, for acoustic and electric instruments, respectively. Thanks to microphone-bearing iOS devices, it’s mostly no longer necessary to purchase a separate tuner unless you absolutely require an audio input jack and you haven’t purchased an iOS accessory that provides one. While not exactly a dime-a-dozen, many tuner apps can now be found at the App Store. 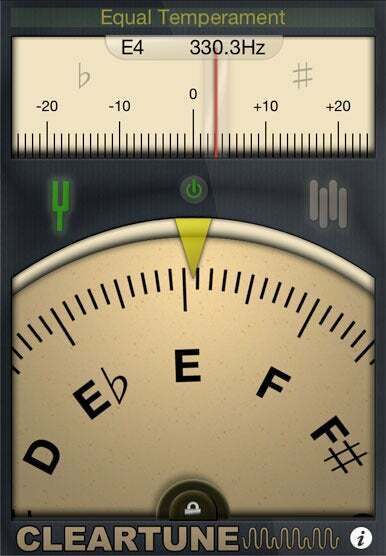 One such app is Bitcount’s $4 Cleartune — Chromatic Tuner. Pitch Perfect: Cleartune allows you to fine-tune your instrument to 1/100 of a cent. Cleartune operates in two basic modes. The first is the pitch identification mode that you’re accustomed to seeing in other tuners. Play a note on your instrument, your iOS device’s microphone picks it up, and a wheel and graph indicate where that pitch falls—above or below the pitch you’re trying to hit. Unlike other tuner apps I’ve used, Cleartune displays results as fine as 1/100 of a cent. So, use the big wheel to get close and then fine tune with the graph that shows these much smaller increments. As the volume of the note you’re playing decreases, the red indicator line in the fine-tuning graph fades, indicating your reading may not be reliable. The other mode is Pitch Pipe mode, where you tune your instrument to a playing pitch. For example, in this mode, dial in a Bb on the wheel, choose an octave, and tap the On button. The tone will play and you tune to it. You can choose four different kinds of waveforms to tune to—sine, triangle, sawtooth, and square. (Each waveform offers a different timbre.) This mode also offers a lock switch that, when engaged, allows you to only set the tuner to exact pitches. Turn this switch off and you can adjust the tone a little sharp or flat. Cleartune offers some other advantages. One is the ability to recalibrate A4. Without miring non-musicians in unnecessary detail, the gist is that, typically, the note A above the piano’s middle C sounds at 440 cycles per second (or hertz). Most electronic tuners and tuner apps stick to this standard. Cleartune allows you to adjust this calibration. To what advantage? Take my piano as an example. I brought my iPhone to the piano and played some test notes. I found that it read a little flat in the middle register. I tapped Cleartune’s Info button and then tapped the microphone icon next to the A4 Calibration entry and played the A above middle C. Cleartune measured that note and recalibrated A4 to 437.2 Hz. With the tuner recalibrated to reflect the piano’s notion of A (and its surrounding notes) I could use the tuner to tune my guitar so that its A matched the A on my piano. With the vast majority of other tuners this kind of trick simply isn’t possible—A is always 440 Hz. Note that you needn’t use the microphone. You can also manually enter a number—442, for instance—to recalibrate the tuner. Overall Cleartune is an impressive tuner but, like other tuners, it can have problems with very high and very low notes. It wasn’t, for instance, able to determine pitches when I played the first eight notes on my piano. Similarly, the app got lost with the top five piano notes. On the other hand, it had no problem with my acoustic and electric guitars and was able to reliably deduce the lowest open string (C below a bass’ low E) on my 10-string Chapman Stick. I’ve used less expensive tuner apps that get the basics right, but Cleartune is a standout for its flexibility in offering tuning modes that go beyond the basics. Whether you’re a guitar, bass, wind, string, or brass player, if you need that kind of tuner, give Cleartune a try.